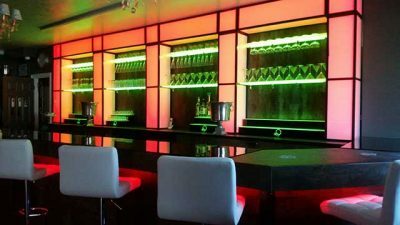 Words cannot define how amazing customized designs has highly satisfied me with my experience with this company. Brian and Jeff were very helpful when I purchased this amazing table. 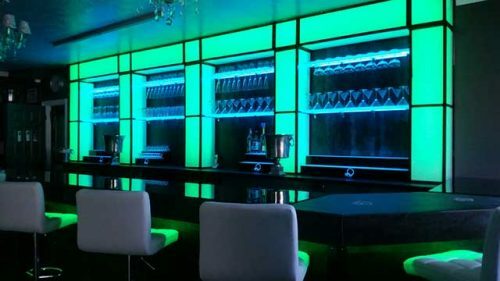 It has changed my lounge Atmosphere Dramatically! I am very pleased with my investment with Customized Designs yet again. Great product and great customer service. 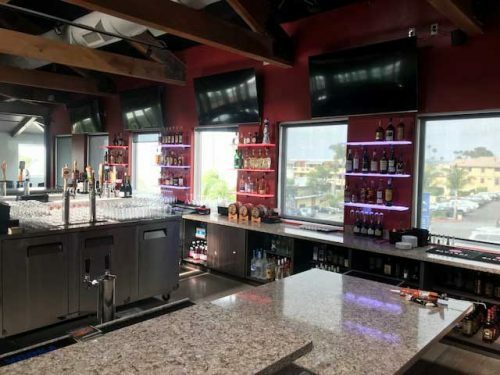 Our bar constantly gets “ohh’s” and “awe’s” from everyone that comes in. 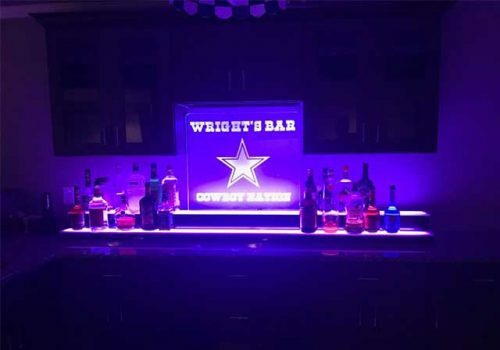 Will definitely will be ordering again for my other bar! 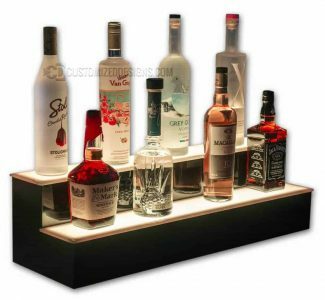 Bought this one for my home bar and it works great.Always get compliments.Team did the fantastic job and were very responsive even reach you out on the email and give you nice preview of image you would like to see on the product. Customized Designs were absolutely fantastic to work with from beginning to end. I only wish my photo captured the actual vivid colors of the final product. Its much, much better in person. 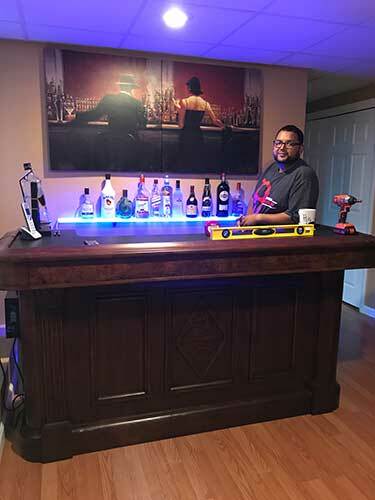 I am a 100% satisfied customer and love the addition to my bar. 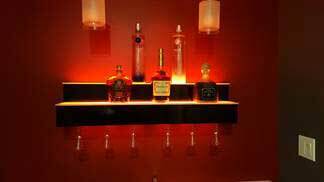 Absolutely love my bar shelf, the product is great, customer service, while creating the design, was amazing. This company rocks! Product is great. Love the design. My customers love them as well. This team did an awesome job! The ordering process was simple and the acknowledgements were very timely. They exceeded their initial delivery expectations during their holiday rush period so i highly recommend doing business with this team. What an incredible addition to my bar! Looks great! 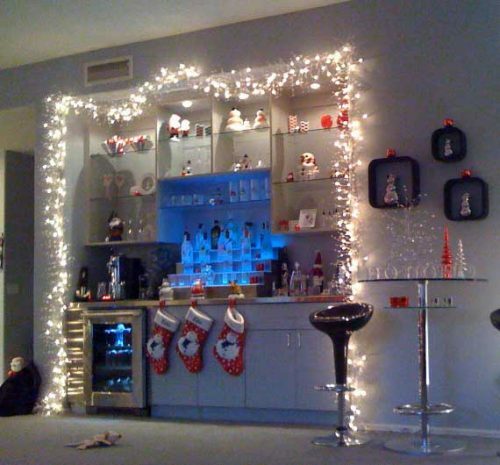 Love the lights. My buds are jealous! Very reasonably priced . Fit perfectly and looks better than we thought. Very happy with the purchase. Beautiful! I can color match these shelves to match the colors I pick for my fireplace. I only have two notes. 1st, the connectors should be secured with something other than heat-shrink, if you ever intend to separate them. 2nd, the IR sensor works on the same spectrum as other remotes, so you may well get unintended effects from using a TV or other remote (my TV remote volume changes the color, etc).Overall, I'm quite satisfied. I will be looking to buy more products for other ares of my house. Great product, works just as described looks better than I expected. Customized Designs is the best company that we have worked with in a long time. Their customer service is second to none, VERY responsive and helpful. 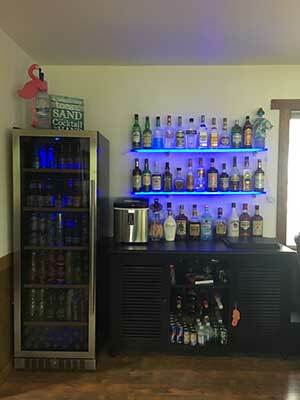 I can’t say enough about their products: we purchased multiple sizes of curvy shelves and a table for our home bar. Stunning doesn’t even come close to how good everything looks. The quality is impeccable! This is an excellent product, well made, functional, easy to use, and is exactly what I wanted. I really appreciate the multiple width options, made it east to get the exact width I needed for my opening. We ordered the 4 step display and received it in short order. It came in packaged well and without damage in plenty of time for our Christmas party. 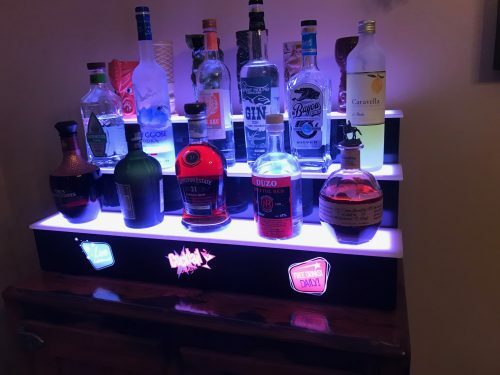 I love my 2 tier 36" lighted bar shelf! A night out on the town in my own home! Just pull up a chair and live in the moment! 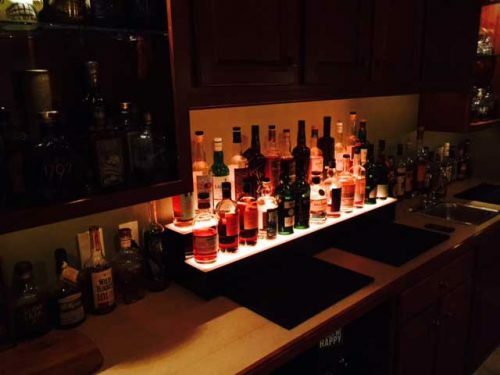 Totally blown away with the LED lighted bar shelves I bought. Pure craftsmanship! Our three step unit was exactly what we were looking for. Delivery was prompt. The unit was packed well and arrived in perfect condition. 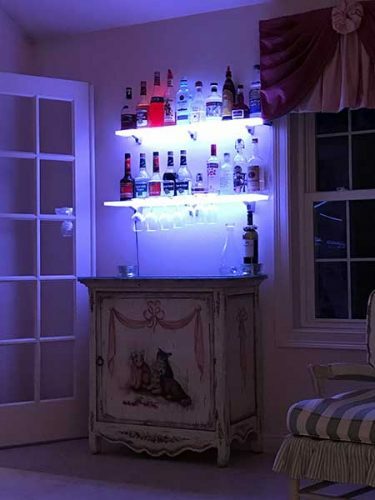 The shelves are very well made and sturdy, but the LED lighting is the real topper. 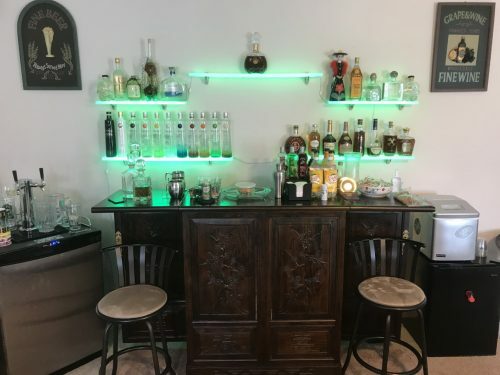 Our home's bar area is going to be a truly fun place to gather now. Should we have the need, we would absolutely buy from Customized Designs again. 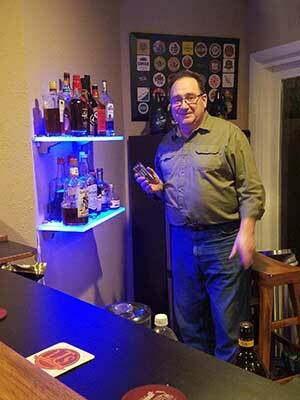 My Customized 3Step display has changed the way my husband entertains his family and friends. 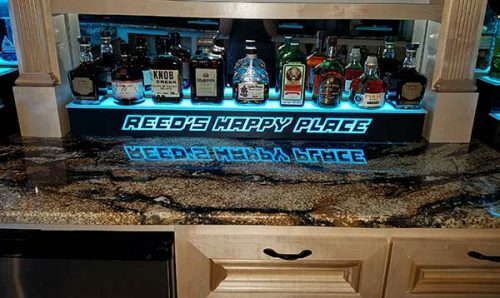 He posted this display on social media and bragged about his Father's day gift and all of his friends loved it. He even have our your web information for any of his friends that would be interested in purchasing a display. 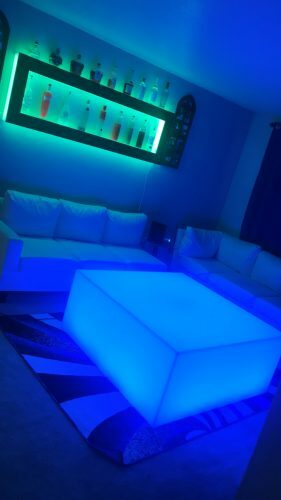 My husband and I loved how it looked without the lights on so when we turned the lights on we fell in love with it even more. Once again I want to thank you all for your great work and perfect timing because we received it in time for my Father's day presentation. Everything aboutthis display says upgrade. Thank you for your time. 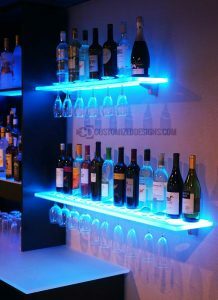 The two wine glass rack LED shelves I ordered are fantastic! The only thing that I would change is possibly moving the rack part as close to the front of the shelf as possible to maximize the shelf space behind the stem bases. I really appreciated the customer service in keeping me informed about where my order was in the process. I received the steps. I opened the box everything was in excellent condition all the lights work good. I really haven't installed where it goes but can't wait to do so. I'm can only imagine how it would look but waiting for the builder to finish by Friday to install. Thanks again for an amazing piece of art. HAD SOME TROUBLE GETTING PACKAGE DUE TO SIGNING FOR IT. BUT IT ARRIVED IN ONE PIECE AND IT LOOKS SO BEAUTIFUL IN THE BAR ROOM. EVERYBODY LOVED IT INCLUDING ITS RECIPIENT. GREAT GIFT. I knew I was ordering a quality product but I had no idea! They are beautiful and very sturdy. Super bright! Plus the entire staff was quick to reply with any and all questions through the ordering process. 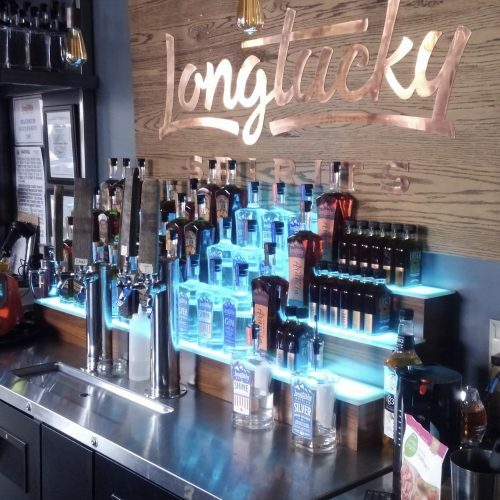 We now have the nicest liquor display of any bar in Central Texas! It's perfect! Joe loves it! 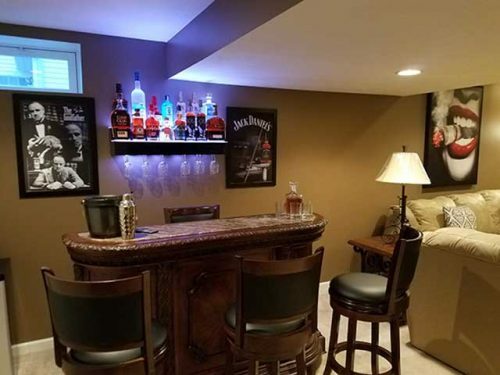 It's the most beautiful way to showcase his family's bourbon. 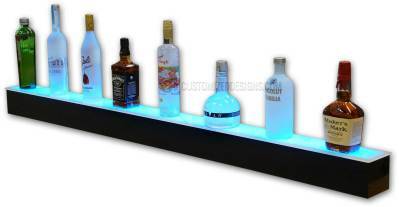 The LED wine glass shelf is a great feature to any bar! 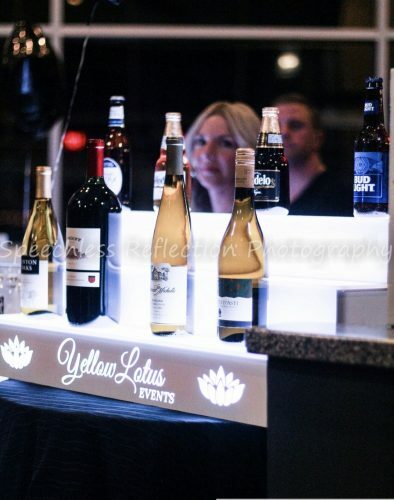 It not only serves as a shelf and wine glass holder but it draws the customers eye to our premium wine selection. It helps in our upsales of our more expensive wines. Let's be honest here we are all concerned with the amount of money we bring in at our establishments and this product helps sell even more. 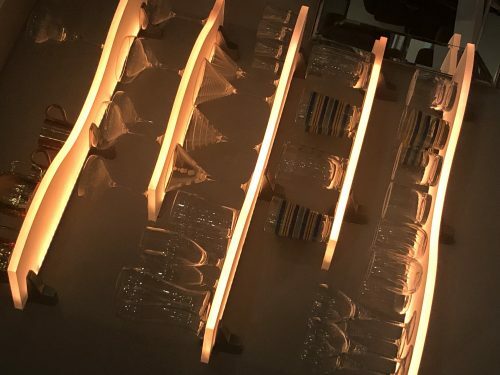 The quality that goes into the engineering and making of the product is shown through the longevity of the shelf. 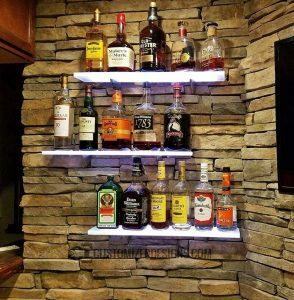 This isn't the first shelf we have bought from customized design and we are going to be repeat customers for a very long time!! The whole experience was perfect...from beginning to end. 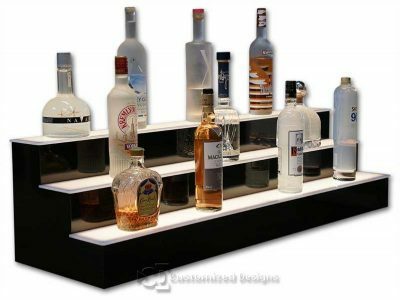 I truly loved the fact that the shelving units could come in virtually any size. It made my life much easier due to the demensions for my space. My two units arrived separately (on different days), but it did not make a difference in my case. They were packaged so well that there is no way their products could ever become damaged in transit. Once the units were installed, I fell in love with the amazing look. 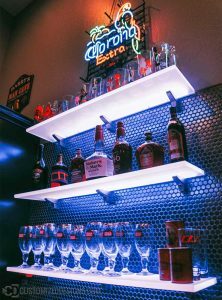 They made my bar look truly custom made and I could not have asked for a better idea than these lighted shelving units. Thank you for your service! With so many 5 star reviews, you'd wonder if they were just posted by the company. I can assure you that they were not. These shelves were perfect. 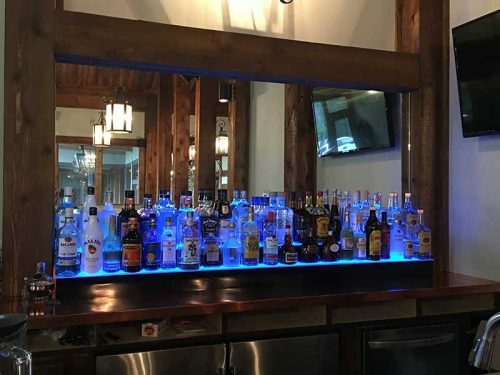 they look fantastic and the shelf brackets couldn't have been any easier to hang. Absolutely love this product! 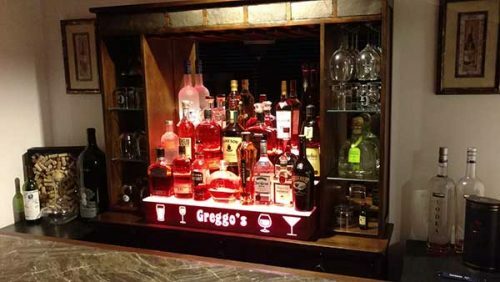 I ordered one custom made display for my bar. The design team helped with my logo and the finished product was amazing. Beautiful, Clean and well build. I would order again from Customized Design. The customer service was excellent throughout the process, including help rearranging the delivery for a personal emergency. 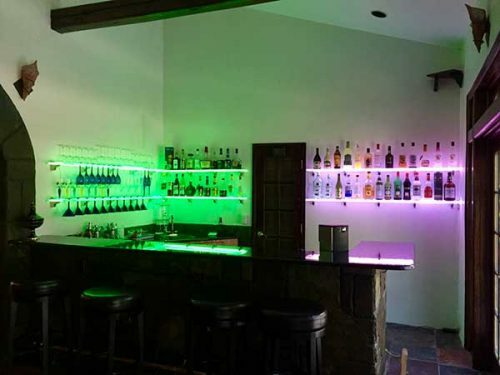 The product is excellent, looks professional and the lighting is very nice. Packaging for delivery was very good and it was easy to set up. 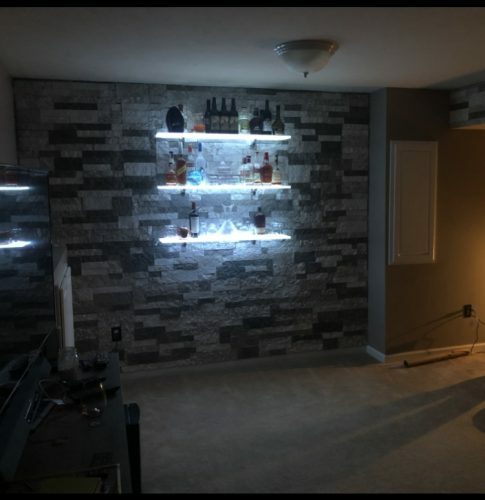 I would recommend both the shelves and Customized Designs. 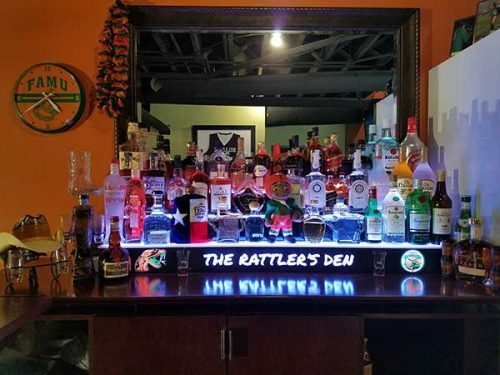 We bought the three tier liquor shelf for our annual Halloween party, but once we received it, we loved it so much it's now on permanent display in our bar area! Thank you! 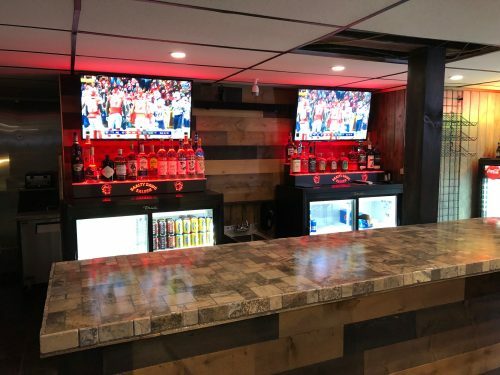 Thank you for your your company's great service and amazing product.The shipment was fine and the shelves where easy to install. 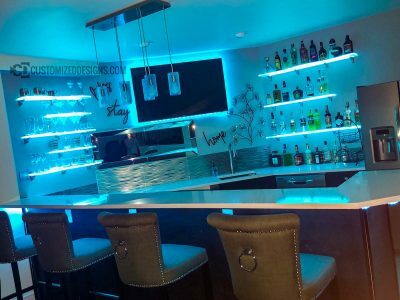 I still need to finish dressing all the cables, but here are some shots of our bar with your lights on display. 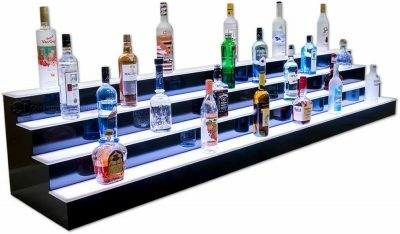 The shelf I received, a 27" illuminated shelf with beautiful LED. 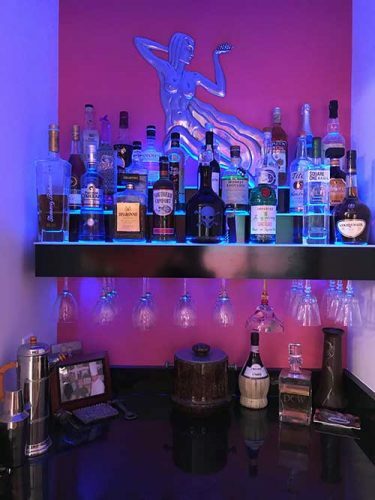 It looks great in my room and I would strongly recommend these shelves to anyone for their business and just nice home decor like I use it for. The build quality is good and shipping was pretty quick for me as well. 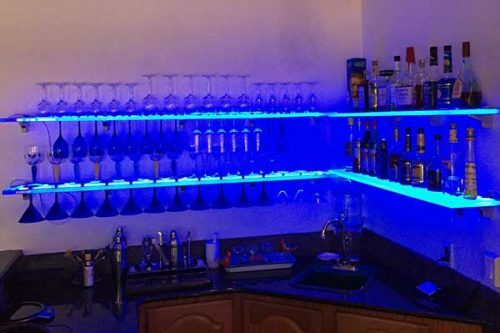 We made an order for 4 wine glass shelves and I must say that we are very satisfied with the order. Ordering was very simple. Customized Designs has a large number of products to choose from and the price was very reasonable. Once I placed my order, it was followed with a personal email from the office manager making sure that the order was correct. I appreciated the personal note and for checking to make sure everything was okay. I had a few questions on the order and the office manager responded very quickly and professionally. The order was mailed promptly and upon opening the package, I was very satisfied with the product. 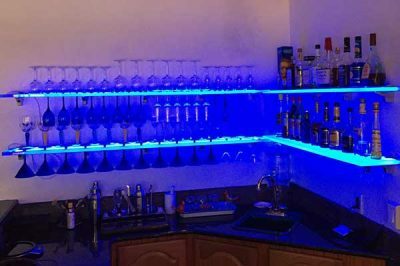 All in all, it was a very pleasurable experience and I would not hesitate to order from Customized Designs again and/or refer them to anyone else looking to buy LED glass shelving. 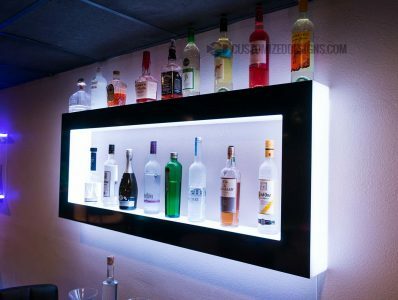 I reviewed a number of LED shelves online and even purchased a less expensive version and the quality was apparent. 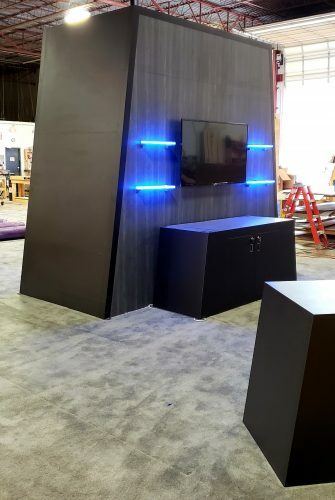 I ordered the 60", 9" wide from Customized Designs and am thoroughly impressed. The product arrived in two weeks. Packaging was impeccable and I was equally impressed with the communication from their team letting me know it was arriving and to inspect and test the shelf. 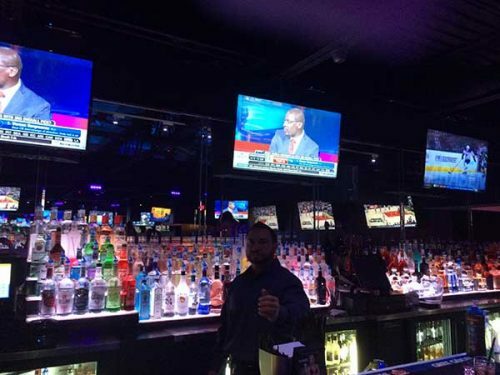 The quality is exceptional and and very impressed with the mounting hardware and instructions. Overall, well worth the extra money spent. We had some issues with my Logo but the guy was so great to work with, he helped us figure out how my Logo would work best and it looks fantastic. It only took two weeks from the time I purchased it to the time I got it in from UPS (as a special order). Everyone I dealt with was easy to work with and they were great on following up with me. My shelf looks great in my store and I am one happy camper!!! Thank you, thank you, thank you! I love it. 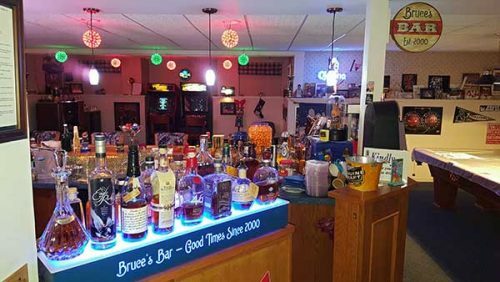 Really transtormed my old useless entrtainment armoir into a perfect bar. 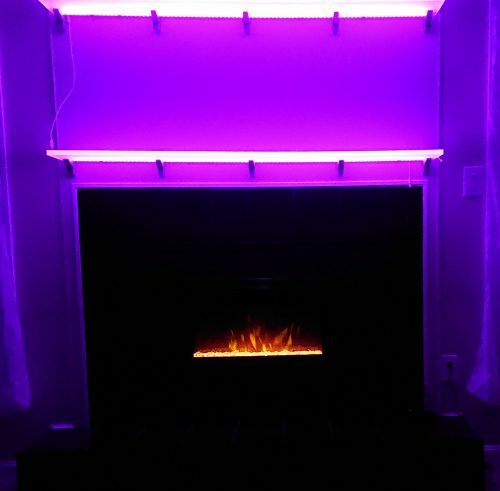 Creates the mood with the lighting. WORTH EVERY PENNY! Nice craftsmenship and packaged/shipped so well you can order without fear of delivery problems. 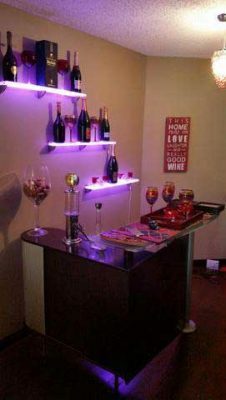 Ordered a beautiful 36" shelf with wine glass holder and was easy to install, and easy to operate. 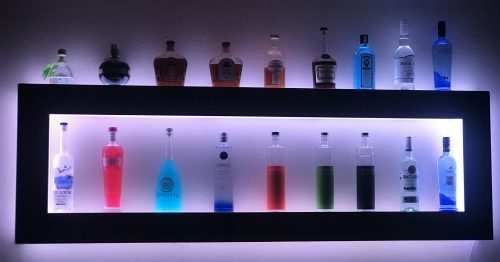 Looks wonderful in my home bar! 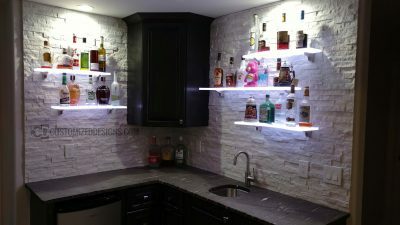 Loved it so much I ordered to more low profile shelves to place on each side of my home bar's sink! 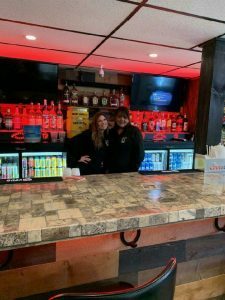 DEBBIE was wonderful and helped me over the phone and gave me a return customer discount! Unbelievable service and some pretty amazing products! I would only order with CUSTOMIZED DESIGNS! I was a little concerned picking colors and size without ever seeing one in person. But it arrived in excellent condition and exceeded my expectations. Everyone that has visited has commented on great it looks and a couple have expressed interest in getting one for themselves or as a gift. I have been collecting telephone insulators for years and have always been looking for a way to display them. They are multiple colors and shapes and look great if lit correctly. 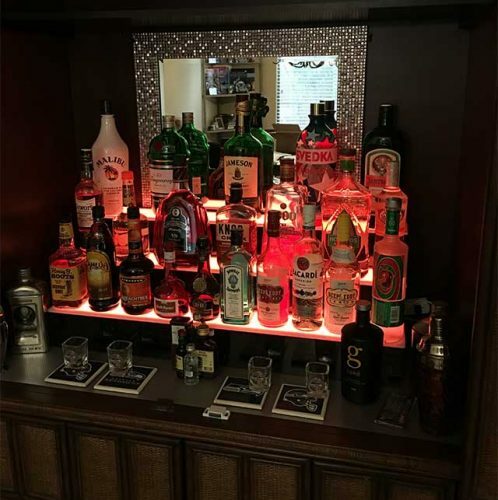 The LED shelf was the perfect solution not only displaying the insulators but also providing some ambient light when viewing TV. The instructions for the controller and hookup were good. However there were no instructions for mounting the wall brackets. It took me longer than it should to figure it out, but I am a DIY kinda guy and figured it out. I would suggest CD to develop and include mounting instructions. Overall I am very pleased with the product, service and quality. 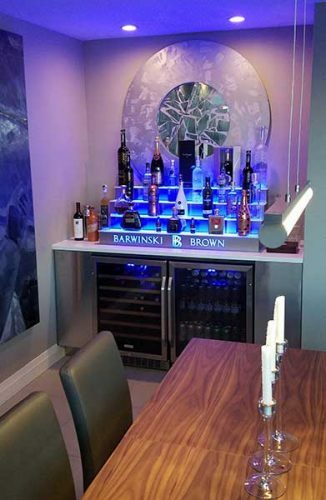 I had a custom liquor display built for my home wine room and the display looks incredible,. Throughout the entire manufacturing through delivery they stayed in contact with me to ensure everything went flawlessly. 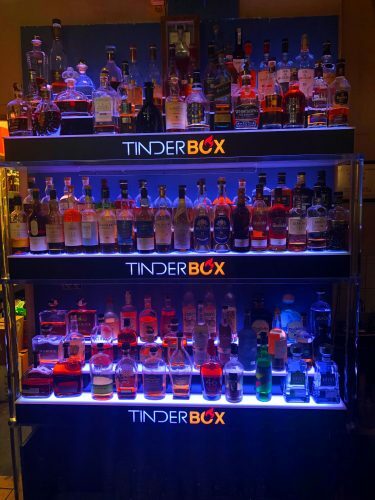 This is the liquor shelf to end all liquor shelves. 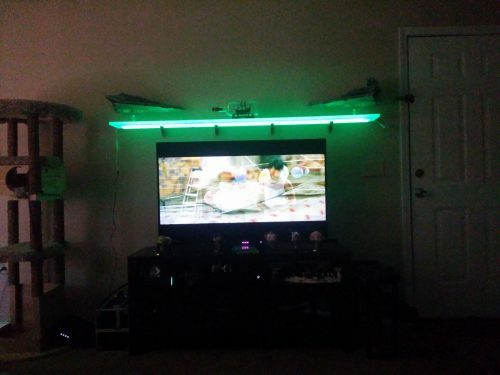 The LED lights are awesome, but what really sets the shelf above the rest are the super sturdy mounts. These things hold the shelf in without any play, making it a rock solid setup. 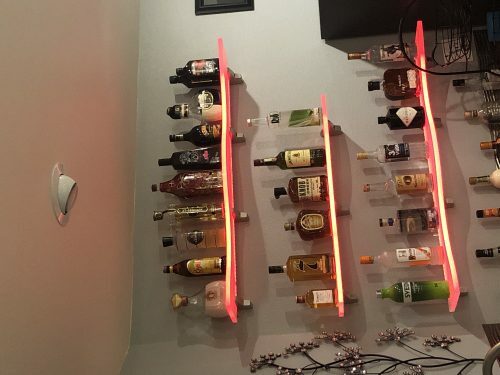 Next time I need a liquor shelf, whenever that may be, I know where I'm getting it. Product is exactly what I hoped it would be. Very fair price and good communication throughout the sales and delivery process. Very happy. I have not used my purchase yet, but purchasing and receiving this product was an easy process. Absolutely one of the BEST purchases I've ever made. I HAVE and will continue to recommend this product to everyone I know. Thank you Customized Designs. You guys are the best!!!! I called to have some custom made one's done and it was handled efficiently and they even arrived before Christmas. I could not be happier with the service and the product. Highly recommended!